finally the provider and I managed to embed YT vids to the official website (lol - took some time - anyway - "soundclips section btw)). So of course now we're looking for some cool new vids to add them to the website and our youtube channel. So the first one, who posts a new (!) cool walkthru of the VH4 sounds (we're in need for some more VH4 clips actually) gets a free (euro) carton with merchandise (shirt, cap, stickers) right before christmas from us. It shouldn't be recorded with a cam mic, but lets say something better. Please post the link into this thread. Lets go, I still have some shirts left from the last stock - and I will send one to you then. That's it?! That's a lot of work for that. Maybe you could offer at least a Columbus. How about a Rolls MP80 which runs off phantom power as well? That's better, but since you demand better than camera mic & hi quality vid, people who use this sort of equipment would probably already have something better than that. would a walk-thru of a Herbert/VH4 rig used in tandem qualify?? Mines almost done. Who are you planning to kill?? DIEZEL HERBERT and DIEZEL FL w/ V30's (sold ) ENGL e530 preamp bought back instead! I already had this done, I don't think it's what your looking for but here it is! Man, you make me miss ch2 VH4! I know, it sounds more gainy than it feels. Like an old Marshall. Really a unique channel. The "-" gets close on the Herbert but than you miss the "+" on Channel 2. Last gig (prior to my trade) I used the "-" and it was great for the Classic stuff. My Herbert stays on "-" pretty much all the time, even for metal tones, I know what it's capable of, but damn you! I want a VH4 again! I don't know what it is with me & Diezel amps, but they just talk to me. I wanted to move my Einstein for a VH4, but the size, weight & Texas mode are just too appealing to let it go. I hear ya! I want 1 of each. In fact 2 of each because I'm sick, really sick! In Loving Memory...Rest in Peace. Cool demo man! sounds killer. As soon as i get mine doe ( and i dont kill the cameraman..LMAO) i will send it off. Rig: Fender Classic Player Jazzmaster > Pure Tone Buffer > ISP Decimator > Earthquaker Devices The Depths> Lovepedal Kalamazoo > Empress Tape Dealy> Neo Instruments Mini Vent > Lehle Little Dual > Mesa Lone Star Classic and Mesa Tremoverb. Last edited by Hartmut on Sat, Dec 05, 2009 8:01am, edited 1 time in total. Länger als 10 Minuten . . .
Last edited by Hartmut on Sun, Dec 06, 2009 8:34am, edited 1 time in total. We will have some videos from live and in the studio on our new website and youtoob channel when they launch early next year. I will post links when they do. Debut album, "Generation Nothing" now available on iTunes, Amazon, Napster, Spotify, etc. How do you like the Herbert that you traded for in comparison? Yea the Herberts are cool too. Here are 2 of mine ! Diezel VH-4 with Diezel 4x12 cab. Recorded with Shure SM57. Other comes soon! Unfortunately I don't have more vid yet wich is not recorded by the cam's microphone, but I'll make. Awesome vids. Harmut won of course - but keep them coming, I still have two or three shirts left. Diezel Einstein (EL34) in white. 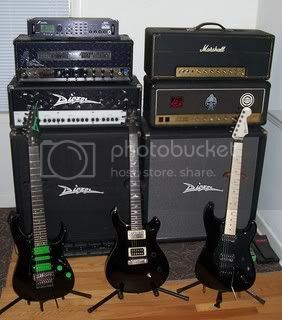 Diezel 2x12 FL V30, Diezel 2x12 RL Hempcones, PRS Mark Tremonti II Black Slate, PRS Mark Tremonti II Angry Larry, Kramer Pacer Custom 1 (1989), Kramer Pacer Custom 2 (1989), Ibanez SZ 4020, Ibanez RG 1527 RB with Painkiller PUs, Patrick Eggle Berlin in Black with PRS PUs. Hughes & Kettner Tube Factor, Morley Mark Tremonti Power wah. I already did some today, will continue tomorrow. Meine Tochter pflegt zu mir immer zu sagen: "Hey Alter, ich bin doch kein Tentakel"
Man I love that video, great playing, great amp! You guys should send a shirt to that guy because his videos have officially sold me on a Schmidt, when I sell some stuff . It sounds like an absolutely fantastic amp from those vids. I finished my newest sound test video clip with my Diezel VH-4 and 4x12 cab, I hope you'll enjoy it! Is that you playing the drums?! Bit off topic but that snare sounds huge for an electric kit! Yes, I absolutely did everything on this video from the playing/recording/mixing to the video directing/editing. you've dialed in some killer tones on that vh4 man. sounds killer! 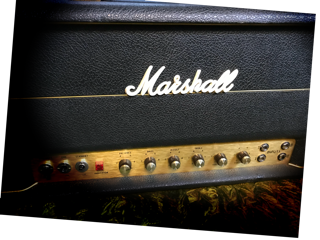 watched your other videos, i really liked the jose modded marshall as well it sounds fantastic. but i was surprised at how lacking and small the wizard and the bogner modded marshall sounded compared to everything else. of course maybe it's different when you were in the room, but the Diezel and the Jose Marshall just seemed to sound so much better to me! what do you think ? This video will be my next lesson on GMC. I'd like to dedicate it to my Grandfather, who died last December. I used Diezel VH-4 and 4x12 cab.